Custom Skull Engagement Rings and skull rings for men have grown in popularity in the jewelry industry with the advent of CAD programs. In fact, even men who do not normally wear jewelry will shop around for skull rings. If skull rings were previously worn by rock music fanatics and bikers, they are now well in the mainstream media. In fact, many celebrities have been rocking Custom Skull Engagement Rings in the public eye. Whether you like the look of skull rings or you like what they represent, Valeria Custom Jewelry offers a wide range of Custom Skull Engagement Rings as well as skull rings for men. This Custom Skull Engagement Ring has 2 skulls on each side of the center stone. The accents for a “V” halo and frame the center stone, making it look larger. As always, the design is totally able to be changed. You also aren’t married to black diamonds as we can use many types of stones. It is shown with an optional matching band. The meaning behind the skull and what it symbolizes is what is most appealing to men. Most commonly, the skull symbolizes death and mortality. This can be the death of an enemy, death of a concept, or death of a lifestyle. Thus, the death of one element of life leads to the birth of the next element. In addition, the skull can represent the rebirth of another life. For some, the skull is simply a reminder of the mortality of the human species. Ironically, high quality Custom Skull Engagement Rings will outlive their owners to be owned by the next generation of mortals. The popularity of Custom Skull Engagement Rings makes them easily accessible in the jewelry market. Skull rings are normally heavy-duty rings with bold designs. They are very durable, meant to last for years and years. This was actually a skull ring guard that we made 2 of. They were soldered onto a plain solitaire engagement ring, turning it into a skull halo engagement ring. So..if you want a skull engagement ring but already have a ring, it is possible to alter your existing ring. Custom Skull Engagement Rings can be found in all kinds of metals. Silver and gold are the most popular metals for skull rings. However, you will find skull rings made with more expensive metals as well, such as Platinum and Palladium. With the skull ring market, there are many varieties of rings for you to choose from. For example, many skull rings will have stones in the eye sockets. Some Custom Skull Engagement Rings will have stones on the sides of the band. In addition, precious stones such as diamonds have also been used in designer skull jewelry. The Custom Skull Engagement Rings created by Valeria Fine Jewelry are not limited to these stones as a large variety can be used. This is our art deco smokin’ skull engagement ring. It has skulls on both sides of the ring with wisps of smoke blowing around them. This one holds a 5mm round stone and has 1.3 mm accents in the halo and 1.5mm stones down the sides of the ring. Larger stones can be used if you want a bolder look. We also have a taller version of this ring with a larger skull. There are many types of skulls to choose from when it comes to Custom Skull Engagement Rings. Some skulls seem to emit emotion while others are fairly neutral looking. Skulls can also be combined with other symbolism such as warriors, pirates, or animals. In addition, some skull rings utilize more than one skull in their design. Whether you are looking for Custom Skull Engagement Rings without stones or a multiple skull ring with plenty of colorful stones, Valeria Fine Jewelry can make what you are looking for. For some reason, people like to combine the infinity engagement ring with skulls! We have made more than a few. And here is another one. 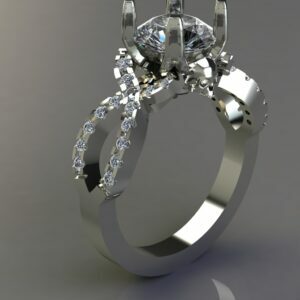 The rise in popularity of Custom Skull Engagement Rings men has also increased their availability. But don’t be fooled by a cheap Asian skull ring. Skull rings from Asia are thin and cheaply made. The gemstones or diamonds will also be of lower quality than advertised. Do you want a quality ring with the stones you are promised? Get your quality Custom Skull Engagement Rings from Valeria Custom Jewelry! 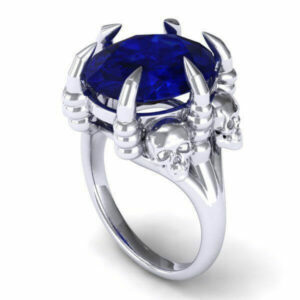 Our Clawed Engagement Ring with Skulls is one of the more interesting skull engagement rings we have created. The 10x8mm Sapphire is held in place by 6 clawed prongs, so it isn’t going anywhere. On each side of the center stone are 2 skulls. If you would like to use another skull in it, or wanted black diamond skull engagement rings, we can do it. You are the boss! These Custom Skull Engagement rings are truly a testament to Valeria Fine Jewelry’s craftsmanship, creative eye and extensive knowledge of jewelry design. Because each of Custom Skull Engagement Rings are individually made, no two are ever alike. You can rest assured that your rings are as uniquely made as you are. And with Lucas’ personal contacts with diamond and precious gem sources from around the world, he’s able to ensure that the materials used to create your one-of-a-kind pieces are of the highest quality. Why settle for mass produced engagement and wedding rings at commercial chain stores when Lucas at Valeria Fine Jewelry can craft you a piece with personality? Take comfort in knowing that his main goal is to exceed your expectations and if you do a little online research, you will see we do just that. Click HERE to learn more about custom jewelry, to see more of our portfolio, or to contact us with your idea for a custom engagement ring. Click HERE to see our portfolio of custom engagement rings. It can easily cost less to have your own custom engagement ring made than it does to buy a mass-produced ring that has no personality from the mall.